Adaptive Control (second edition) shows how a desired level of system performance can be maintained automatically and in real time, even when process or disturbance parameters are unknown and variable. It is a coherent exposition of the many aspects of this field, setting out the problems to be addressed and moving on to solutions, their practical significance and their application. Discrete-time aspects of adaptive control are emphasized to reflect the importance of digital computers in the application of the ideas presented. 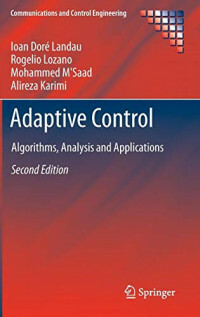 The second edition is thoroughly revised to throw light on recent developments in theory and applications with new chapters on: multimodel adaptive control with switching, direct and indirect adaptive regulation and adaptive feedforward disturbance compensation. Many algorithms are newly presented in MATLAB® m-file format to facilitate their employment in real systems. Classroom-tested slides for instructors to use in teaching this material are also now provided. All of this supplementary electronic material can be downloaded from fill in URL. The core material is also up-dated and re-edited to keep its perspective in line with modern ideas and more closely to associate algorithms with their applications giving the reader a solid grounding in: synthesis and analysis of parameter adaptation algorithms, recursive plant model identification in open and closed loop, robust digital control for adaptive control; • robust parameter adaptation algorithms, practical considerations and applications, including flexible transmission systems, active vibration control and broadband disturbance rejection and a supplementary introduction on hot dip galvanizing and a phosphate drying furnace. Control researchers and applied mathematicians will find Adaptive Control of significant and enduring interest and its use of example and application will appeal to practitioners working with unknown- and variable-parameter plant. Praise for the first edition: …well written, interesting and easy to follow, so that it constitutes a valuable addition to the monographies in adaptive control for discrete-time linear systems… suitable (at least in part) for use in graduate courses in adaptive control. Using this tutorial will take you deeper into Dynamics NAV from a developer’s viewpoint, and allow you to unlock its full potential. The book covers developing an application from start to finish in logical, illuminating steps. Insider tips on having the best island experiences, from finding idyllic beaches to exploring historic forts and churches.